Mix the ground meats with the mustard, pepper, salt, breadcrumbs, and egg. Once all the ingredients are well mixed, clean a surface and with the help of your hands shape the meat like a roll. Flatten it and spread the egg and carrots, then cover with the meat keeping the cylindrical shape. 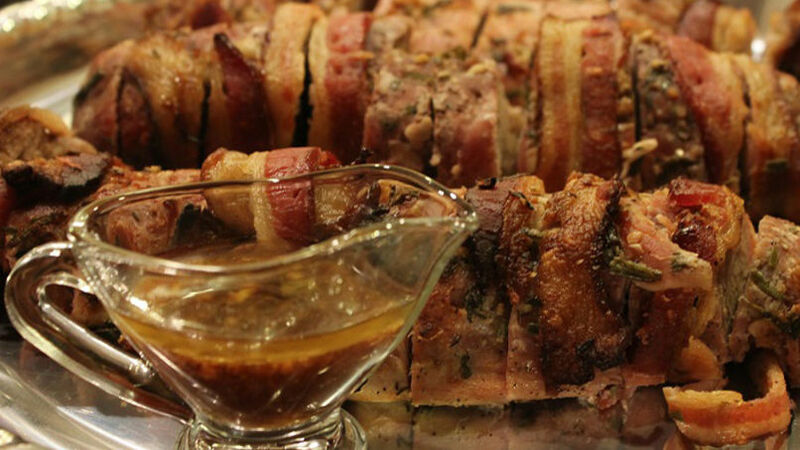 Roll in the strips of bacon. Wrap in a clean towel, securing tightly on both ends so the meat won’t come out. Put the roll to cook in a pot of boiling water with salt for 40 minutes. Serve hot or cold, cut into slices. After cooking, you can bake the roll for 15 minutes to brown it (don’t forget to remove the cloth). The meat roll is one of the recipes that reminds me most of my grandmother. Not only is it one of her specialties, but it’s also one of my favorites. They always come with wonderful memories and that’s why it’s become a very special holiday recipe for me. My grandmother usually served them as cold meat with a side of gelatin, perfect for any time of day. During the holidays the gelatins used are of festive colors like red and green.